Bezoek Toledo voor een dag vanuit Madrid tijdens deze rondleiding door het UNESCO-werelderfgoed. Vertrek vanuit het centrum van Madrid en geniet van rondleidingen door de Kathedraal van Toledo, de Joodse wijk en meer. De tour omvat vrije tijd om zelf te verkennen, meer bezienswaardigheden te bezoeken of een hapje te eten. 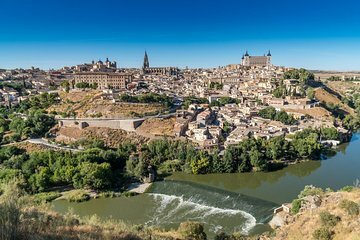 Originally scheduled a tour for Toledo w/ 7 monuments and cathedral access but was cancelled and offered tour for Toledo and Segovia. Long day but both cities very interesting, with lots of history. Would have liked more time to walk around on our own and would have liked a guide on the bus itself to give us more background information and what to expect about the places we were going and countryside we were traveling through. Also ended up running late due to a few people being very late for the bus. (About 30 min). I think there should be a clearer policy about how long a tour should wait. Lovely day trip. Relaxing as there were sufficient free time to do one's own thing. I went to a Michelin Restaurant in Toledo. Took a long winding road due to GPS in some area being lost but was still sufficient time to get there. The group was not too big. Met some nice people on the bus. Guide was good however I noticed her narratives are not exactly the same in English and in Spanish. No importa. It is a vacation not an educational research study :) So all good. I am not there to pass a history exam. Tranquilo. Suits me to the tee. Thank you for the tour. It was an excellent trip with Lydia. Well organized and excellent arrangements. Will recommend this to all. Barbara the guiden!+ was so, nice and very clear on the explanation ,gentle,kidness,just lovely!!!.... Thanks Babara!! Toledo is an incredible place. Time stopped there and you can rally feel like walking in the XVI century. All the landmarks are beautiful and well preserved. The tour is good, we had the 7 monuments with the cathedral upgrade and what you get is a bracelet that allows you to visit several sites. Be aware that you do 3 or 4 guided visits, and the rest you can do on your own during your free time in the afternoon. The tour has some room for improvement though. Our guide was Barbara and she is knowledgeable, fun, and you can see her effort during the trip, however she does the tour in English and Spanish simultaneously and sometimes she switches between languages before completing a sentence, so it may be hard to follow along. Also, it would be great if this tour used the headset devices to hear the descriptions and explanations of the places as many other tours do. At the end of the tour there was some sort of issue with the transportation back to Madrid so a few of us were sent back in a private van so the bigger buses could take other tour passengers. Barbara looked very puzzled about this and apologized many times although it was really not a problem for us, we actually arrived earlier than the bigger group and traveled more confortable in the smaller van. It does look like this is a newer or smaller company which is still getting their organization together. All in all, we enjoyed the day and the format of the tour, and I would recommend it to anyone wishing to visit this beautiful city. Excellent but our guide Barbara spoke three words in Spanish and translated them into English and so forth instead of completing the Spanish sentence before translating. It was rather difficult to understand the continuity of sentences. Although not part of the tour, she should have told us that we could visit at extra cost El Greco's house, which was very close to the last monument we visited with her and she should have told us and/or have taken us to the Cathedral paintings gallery, which included one of Greco's most famous works, during our visit of the Cathedral. We did have plenty of free time to do both missed activities above during our given by the tour free time during the Toledo visit. Also, generally, we visited 4 out of the 8 monuments along with the guide, we found an additional 1 of them by ourselves during the free time and there was no mention by the guide of the the other 3 we missed. Even if they were not so important we should have been told where they were so that we visited them by ourselves as they were included in the tour price. Unfortunately we found about all of the above after we returned to the hotel when we re-capitulated about the Toledo tour. Good value compared with the other tours. Small group with a tour guide who cared about his tourists.